Father Eamon Gerard Murray acknowledges the applause from the congregation during his ordination ceremony at Visitation Church. 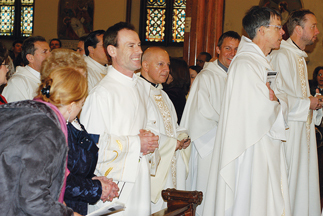 Irish-born Father Eamon Gerard Murray was ordained to the priesthood by Auxiliary Bishop Frank Caggiano at Visitation of the Blessed Virgin Mary Church, Red Hook, on Saturday afternoon, Dec. 10. Special concelebrants at the 3 p.m. ordination Mass included Father Alvaro Grammatica, general pastor, Koinonia John the Baptist (KJB); Father Claudio Antecini, pastor of New York’s KJB, who was installed as Visitation’s pastor the following day; Father Johannes Siegert, associate administrator, Visitation; and Father Anthony Sansone, pastor of neighboring Sacred Hearts-St. Stephen, Carroll Gardens. Sacred Hearts-St. Stephen’s music ministers assisted with hymns at the ordination and the parish hosted a reception following Mass. In his homily, the bishop reflected on the vocation to ministerial priesthood and what it means to share in the threefold office of Christ as priest, prophet and king. He instructed Father Murray to preach the Truth “in season and out of season,” to dedicate himself to holiness and pray often. “It is your most important duty,” he said. The ordination was one of the highlights of the parish’s three-day Great Marian Congress, Dec. 9-11, encompassing the feast of the Madonna of Loreto, Dec. 10, and the Vigil of Our Lady of Guadalupe, Dec. 11. Opening with Friday evening Mass, the weekend featured praise, worship, songs and teachings about Mary. Retired Auxiliary Bishop Guy Sansaricq closed the Congress on Sunday by installing Father Antecini, parish administrator, as pastor. Hours before the ordination, Richards St. received guests from as far as Ireland, Italy, the Czech Republic and California and as near as the next block. Bagpipes played on the street as parishioners and neighbors hurried in to fill pews. Then-Deacon Eamon Gerard Murray processed to the altar with diocesan priests and clergy of the Koinonia community. 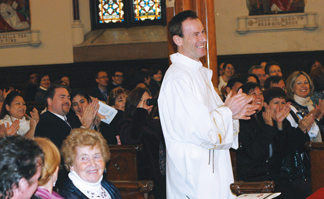 The soon-to-be ordained mingled among the people, greeting his mother, Kathleen, siblings, and nearly 50 relatives from Ireland as well as Father Antecini’s family from Italy. Born and raised in Carrickmacross, Co. Monaghan, Father Murray, 43, realized his vocation after a powerful experience of faith 19 years ago. At the time, he had a successful life in the eyes of the world: a lucrative job as a mechanical engineer, a nice Jeep and a great girlfriend. Raised in a devout Catholic home, he went to church every week and spent time with his family. He hopped on a plane to Toronto with no plans. He roamed about Canada and the U.S. hawking T-shirts, waiting tables and selling Christmas trees. He moved to Scotland for a year before entering St. Patrick’s Seminary in Thurles, Ireland. Two years later, Father John Murray told him about Koinonia and its International School of Evangelization in Rome. He took a course while on a school break. He spent a year with the Koinonia community in Plzeň-Litice (Pilsen), Czech Republic, before going to live at the motherhouse in Italy. In 2004, he joined Father Antecini to build up the community in California. He returned to Rome before rejoining Father Antecini to spread the community in New York two years ago. He was ordained a transitional deacon on June 15 of this year. As a priest he wants to preach the Gospel and evangelize people. He wants to help people know Jesus, receive new life, have hope and be set free from fear — just as he was. “People are dying in sin because they don’t know Jesus. He’s the answer to our hopes and dreams. You’re not going to find that in the New York Times or on the Internet,” he said. The newly ordained will continue to serve in Red Hook, and grow in his priesthood under the guidance of his mentors, Fathers Antecini and Sansone. What a wonderful testomony of God’s Love…Congradulations and may the Lord continue to guide you in everything that He has destined for you to do.